In September 2017, we successfully tendered for the delivery of a joint Strategic Flood Risk Assessment (SFRA) for the London Boroughs of Brent, Barnet, Ealing, Hounslow, Hillingdon and Harrow. The purpose of a SFRA is to determine the variations in risk from all sources of flooding by collecting and reviewing data. This data is then linked to national, regional and local policy and used to ensure that new developments are designed in a way so that they are not at risk of flooding or cause an increase in flood risk elsewhere. The SFRA provides an opportunity to advise on matters such as site-specific flood risk assessments, future flood alleviation schemes, sustainable drainage requirements and to develop policies to manage the effects of climate change and flood risk from all sources. 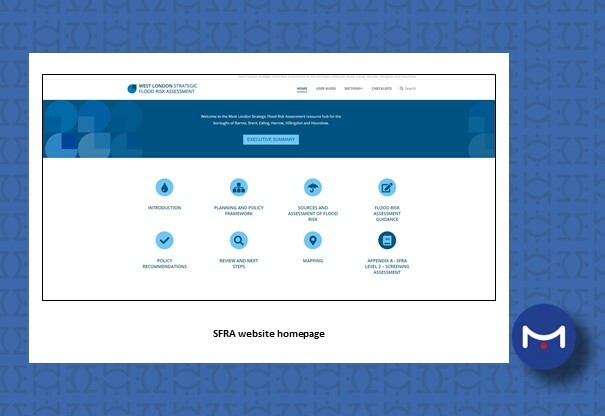 We completed the work in April 2018 using an innovative interactive website format to publish the SFRA – the first of it’s kind in England. The website format was selected as it can be quickly updated in future to accommodate legislative changes and interactive web mapping could be used to present risk mapping in a user friendly manner. The interactive mapping is linked directly to the Environment Agency to ensure the most up to date mapping is always presented and eliminates the need for periodic manual updates.